We’d love your help. Let us know what’s wrong with this preview of The Rise Of Political Lying by Peter Oborne. To ask other readers questions about The Rise Of Political Lying, please sign up. Brilliant denunciation of the political class and the systematic destruction of truth in our public debate. Chilling. This book was written in 2005 by political journalist Peter Oborne as the British 'New Labour' government was drawing to the end of its second term and about to win its 3rd term. Political lying has taken place throughout the centuries. In the UK, it started to crank up with the Conservative governments of the 1980s and from the mid-90s, was elevated to an art form under the Blairite 'New labour' government. Now, of course, some 13 years after the book was written, political lying by government This book was written in 2005 by political journalist Peter Oborne as the British 'New Labour' government was drawing to the end of its second term and about to win its 3rd term. Political lying has taken place throughout the centuries. In the UK, it started to crank up with the Conservative governments of the 1980s and from the mid-90s, was elevated to an art form under the Blairite 'New labour' government. 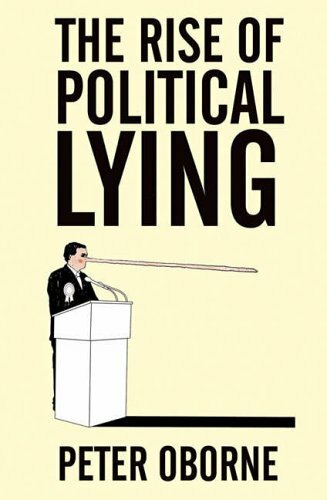 Now, of course, some 13 years after the book was written, political lying by government ministers and members of parliament (on all sides) to each other and to the public is both commonplace and accepted as part and parcel of the political life. Oborne was editor of the Spectator (a British journal on the right) at the time of writing this book. The book is not a heavy read and gives many checked and referenced examples. If the book were to be updated, I wonder how Oborne might consider the impact of social media and ready access to alternative, unofficial news sources? In my opinion, while I do believe political lying has escalated in the past 40 years, I do wonder if the impact of social media and alternative news media has enabled us to discover the lies much more easily rather than having to wait 30 years for official papers to be released (and when they are released much is often redacted). How much has lying increased, and how much was there all along without the means to find "them" out? A good collection of modern political lying, focusing very much on the "new Labour" government that was still in power when it was published. It has a couple of foibles: Oborne seems convinced that Blair's Labour were the first government in modern times to lie systematically. This seems naive (irrespective of the author's political sympathies, which I guess are conservative since he was a Spectator journalist at the time). He drags in a bit of history and a bit of philosophy, appositely enough, A good collection of modern political lying, focusing very much on the "new Labour" government that was still in power when it was published. He drags in a bit of history and a bit of philosophy, appositely enough, but doesn't have anything hugely insightful to say there: he reckons it may well have been ok ("legitimate" is his curious choice of word) for medieval Italians back in the days of Machiavelli to lie like billy-o whenever convenient, but that it definitely isn't now. A reasonable position, maybe, but he doesn't really argue for it. Basically he says times were tough back then. And what, they're not now? Oborne is so enormously precise in his dissection of political lying that I cannot help but be drawn to it. Very insightful, even if Oborne does contradict himself at times. It is depressing though how little has changed since he wrote this around the early days of the New Labour government.